FAQ / New Racer Info. Proudly sponsored by Paul Hutchins Loan Centre, the Hunchee Run is Round 6 of the Club’s Championship Series held on Saturday 27th October. This race is run 99% in the creeks. Racers compete in a two lap time trailed course, competing for double point scores. 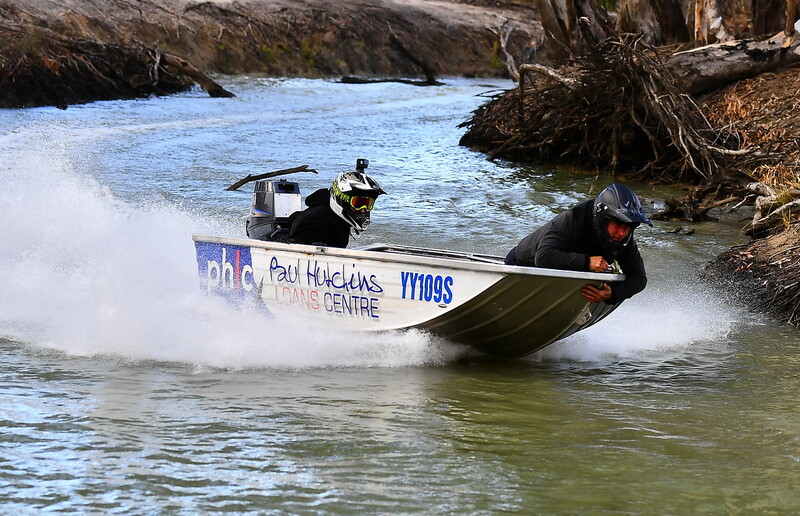 The race starts and finishes at the Renmark Club concluding with a Trophy presentation inside the club from 5.30pm allowing racers to remove their boats from the water and return to the club. After the race the committee requires a period of time to finalise race positions, disputes and any possible scrutineering issues. It is also important to allow spectators who have been upriver sufficent time to return to the club along with Duty Boat personel and other volunteers who have worked tirelessly to run the event. The Renmark Club and Balcony area are also ideal to have meal and view the race. 2018 grid starts will be in the following format. Racers are gridded at one minute intervals and 2 minute intervals between classes. Second return leg is started in the position all boats finish in. If using waterways to get to a viewing position, it is vital to get there in place before closed water times. Please ensure no spectator boats are obstructing race course. It is required that boats are parked in the main river and walking to a suitable viewing position. Riverland Dinghy Club Sweep boat has the authority to request spectators to move boats as needed. All Duty Boats have jurisdiction and spectators are obligated to follow any instructions given by RDC duty boats and officials. Offenders will be reported to Marine and Harbours Please respect the right of racers, and allow all competitors to finish the race before moving off. So what do the different creeks have to offer? Nelbuck Creek Distance to walk from river 50m plus. Bulyong Creek Boat access only 5.2 km long. During this period no boat movement is permitted. RDC suggest that you make your way up river and settle down for the day allowing sufficient time to be in place, taking into account the closed water period and please observe the closed water restrictions when leaving your positions. Sufficient time has been allowed between the race and the presentation at the club for everyone to be back in time. A large range of merchandise will be available for sale on the day at the merchandise stall. Event Medical Plus will be in attendance throughout the duration of the event.